The clarinet in jazz seems to go in and out of fashion every couple of decades. This may be in part because its subtle sounds don‘t necessarily fit with the high-volume, over-miked and often heavily electronic ensembles of our contemporary music culture; and partly also, I suspect, because in its understated way the clarinet conveys emotions with directness that challenges our desensitized comfort zones. Never mind. The CD you‘re holding here is not a fashion statement but a sequence of free – improvisation musical dialogues inviting you to listen in.To do so, you may want to take a minute to minimize the ambient background noise of your own environment. These twelve “Conversations“ tracks, sandwiched between an opening “The Desert and the City“ and enigmatic ciosing “To Be Continued‘ will repay undistracted and active contemplation. Bill Payne is a new voice to this listener, having worked for more than two decades in circus bands and other jobs outside music, while sustaining his soul and spirit with his musical passion even when that means playing only tor himself. He is currently based in Las Vegas. Living and playing outside the music industry with its land mines of clichés and commercial compromises, he‘s also been periodically part of the New York “loft“ scene – meaning performances staged mainly in artists‘ apartments because commercial venues aren‘t interested in taking a chance – along with his longtime musical associate Connie Crothers and other determined stalwarts. Crothers has spoken and written of “moving beyond the separation of free improvisation from tunes‘ including a memorable occasion when she risked inserting a free improvisation number in her group‘s set at a tourist – packed Blue Note night club in New York, and got the biggest ovation of the evening. Crothers was a student of the legend- ary Lennie Trlstano, whose playing combined the detailed knowledge of melody and “changes“ with the rigorous avoidance of lapsing into well – worn bebop clichés. 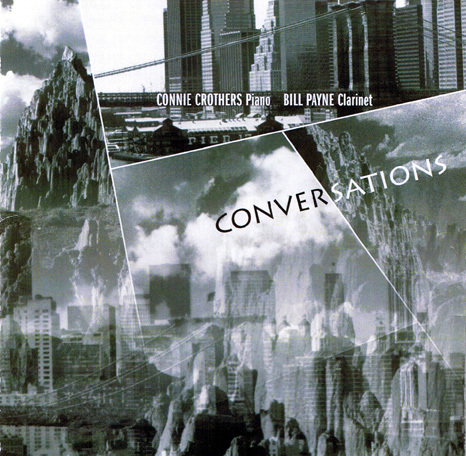 bill payne | connie crothers | conversationsIn her quartet recordings for this label, Crothers has deepened and extended Lennie Tristano‘s legacy. More immediately relevant here, she has specialized in the duet format with its distinctive opportunities for unencumbered communication, recording for example with saxophonist Richard Tabnik, guitarist Bud Tristano, and drummers Roger Mancuso and – way back in 1982, the inaugural recording tor the New Artists label – the immortal Max Roach. On the borderline of what‘s called “jazz“ and a broader avant – garde that defies boundaries and labels, Payne and Crothers share ideas, build and extend each other‘s phrases without getting in each other‘s way. Melody arises spontaneously rather than be pre – set structural design, as generaily required for larger ensembles. Happily tor this listener. this is acoustic music without electronic distortion and distraction. is one of the most versatile pianist on a scene that is often mislabeled “free” jazz. Her pianism has been cultivated through long years of studying and deep listening, evident in each tone, chord and gesture. Overwhelming intensity, at whatever volume, is juxtaposed with transparent beauty in a style that is as unique as it is unpredictable. Crothers has the perfect partner in clarinetist Bill Payne, this disc of dialogs belying a long musical relationship. Just listen to the moment in “Conversation #3” when Payne plays a two-note figure, immediately following which Crothers flourishes downward to land on Payne’s E-flat. In fact, counterpoint is the duo’s MO throughout. It opens “Conversation #4” and is even more rigorous in the tenth conversation. Crothers’ Tristano association is made plain in the latter, but as the tenth track heats up, bluesy inflections and clusters pervade, lending to a surprisingly trilled ending from Payne. By contrast there are the Messiaenic sonorities of “Conversation #12” and, with pPayne beginning in the lower registers and with such rhythmic freedom, it almost sounds like a movement left out of Quartet for the End of Time. the last lengthened, a couplet, a perfectly symmetrical postulation with a pendant moment of repose, four mezzovoce but supremely confident utterances where wood, reed, breath and spirit merge in the expectant tick of time that births an expression. A statement of faith touches space, reverberates, fades, quietly demanding a response. Bill Payne’s opening clarinet invocation is just that, and as might be expected, Connie Crothers answers in kind. The close atmosphere of The Stone begins to vibrate, to resonate with possibility. It’s only the beginning. Where history’s concerned though, it’s not the beginning at all, and the concert you’re hearing encapsulates years, journeys, shared experiences too long for mere verbiage. Bill sought Connie in the summer of 1981, coming off of his many musical adventures in plays, big bands, the circus. “I wanted to play the music that was in my heart,” he says now, “I’d played everything else.” Connie has a stellar performing career, assimilating the vocabularies of masters such as Lennie Tristano and Max Roach, who founded the New Artists label. She and Bill were instant comrades in art. Connie remembers excitedly, “He was one of the ones who got the essence right away. He’d come in, tear it up and float out the door in a state of ecstasy!” What began as a sporadic teacher and student relationship lasted into the 1990s, at which point, the practicalities of life interrupted the exchange. After many years and travels, Bill reunited with Connie, having promised himself that no matter what he played on the road, he would devote daily time to the music of his intuition. Conversa-tions, originally issued in 2007 and re-released on the second disc of this package, attests to the fruits of his experience and to the duo’s flourishing creativity. – intessono serrati dialoghi liberamente improvvisati, divertendosi a proporre una musica dalle coordinate piuttosto originali. Lei proviene dalla scuola di Lennie Tristano ed il suo quartetto insieme a Richard Tabnik, Roger Mancuso ed un contrabbassista che cambia a seconda delle occasioni è una delle realtà musicali contemporanee più interessanti, Bill Payne invece ha suonato un pò ovunque e di tutto, comprese orchestre per il circo.